The Seahawk 100 is a robust lunchbox computer built using heavy duty metal to provide tough, go-anywhere unit ideally suitable for wide ranges of applications such as Computer-Aided Design and geographic information system and professional digital media applications. Built in a unique, innovative form factor, the Seahawk 100 provides an excellent platform for simulation and training applications. Every Seahawk 100 comes equipped with three SXGA resolution LCD displays, dual system cooling side fans and easy access to its expansion slots for immediate system upgrade or maintenance. 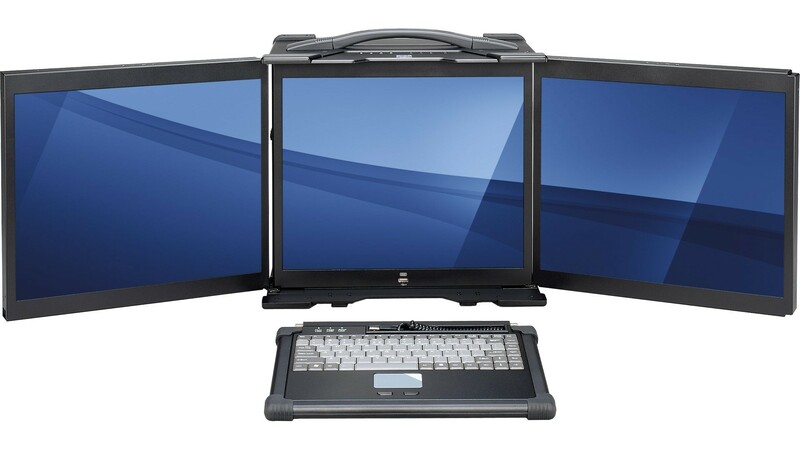 The Seahawk 100 LCD display can be expanded and retracted fully for transporting and storage. The Seahawk 100 with its extra-rugged construction to sustain bumps and its rich features is the most durable and efficient portable solution for your needs.